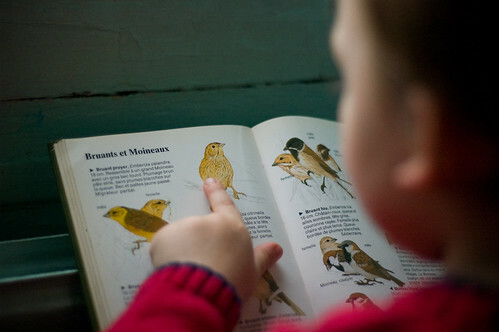 ::: Looking at birds outside and in books. ::: Working on a huge project that will hopefully be our ticket out of here and to the mountains. ::: Listening to lots of Bob Marley (Felix is a HUGE fan) and realizing again just how powerful his lyrics are. ::: Wearing just one layer inside but loving that it is just cool enough for my precious red scarf which I wear EVERY DAY. ::: Wandering around Paris, by myself, in the rain after a nice afternoon with friends. ::: Wandering around Paris, with Tibo, in the rain before going out for a beer and dinner. ::: Seeing signs of spring everywhere I look. ::: Feeling inspired to notice the little things. Felix's room is filled with books. Almost beyond capacity for the little shelves. My MIL saved a massive collection of books from her own childhood and that of her own children. We have copies of Make Way for Ducklings and Mike Mulligan and his Steam Shovel that are 3 generations old with the names of Felix's Grandparents or Great Aunts and Uncles scribbled in child handwriting on the inside of the front cover. He carries them around as if he understands how precious they are. Entering into his room you might think that we spend a ton of money on books (which wouldn't necessarily be a bad thing) but instead you are walking into a veritable collection of heirlooms. I love it. One of our most adored hand-me-downs is an original set of Maurice Sendak's Nutshell Library from 1962. The little books are the perfect size for tiny hands. Felix loves to carry all four books around the house, stopping to enjoy one every once in awhile. He shoves them under his pillow at night. He reads them in the stroller on the way to the garderie. He frequently changes which book (or which page) is his favorite amongst the four, asking me to read it over and over again. When we first started reading them a few months ago (my MIL wisely doles out the heirlooms slowly), it hit me that that I knew all of these stories but in a musical version. I realized that these are the stories featured in Really Rosie (1975) - a musical collaboration between Maurice Sendak and Carole King. Carole King composed music for all four books and they were put together under the guise of animated TV special about a young girl named Rosie, living in Brooklyn and entertaining her friends with the exaggerated and absurd adventures of her life. King did an amazing job of bringing the characters to life with her music and her compelling voice is pleasing for both adults and children. I think the Sendak-King combination works marvelously and it blows anything made by Disney out of the water. A beautiful morning. This little garden of ours is my sanctuary amongst the concrete. And spring...it brings on a strong desire to be closer to nature. Last night we stayed up late researching cities we couldmaybepotentiallyhopefully live in someday. We are itching to get out of the city and back to the mountains. This summer we are going to take a week exploring small villes on mountain train lines between Lyon, Grenoble, and Chambéry. We have our criteria pretty well laid-out and now we want to get a sense of the community that lives in these various places. I suppose we are hoping that one will just jump out at us as this is a place we could live for a long time. Or it might just be a fantastic week of riding trains, camping, hiking, and exploring. That sounds pretty good too. A mountain girl. A forest dweller. A nature lover. A guide. This little pit stop has been great but I am ready to get back on track towards what I love. So there it is. The plastic toy that I hate. I don't want to knock all plastic toys - I'm sure there are some really super ones out there (are there?) but this one has been on my hit list for some time now. And it is partially my fault. While I was doing my homework (a hypothetical lesson plan on slavery and chocolate), I came across this article about Teun van de Keuken and his slave-free chocolate movement. Van de Keuken tried to prosecute himself because he knowingly ate chocolate that involved the slavery of children. The filmmaker's first act of protest was personal. One day he ate 19 chocolate bars and then turned himself into police for knowingly buying a product made with slave labor, something he says is criminal under Dutch law. "At first, I just called the police and said I did a terrible thing. They said, 'Don't worry, we all eat chocolate, good-bye.' Then I hired a lawyer." His attempt to prosecute himself was dismissed by the court, but Van de Keuken launched an appeal. In the meantime, he took his TV show to Burkina Faso to find some of the children forced to work on the cocoa plantations — kids, he says, who had never tasted chocolate until he gave them some. (They liked it.) Van de Keuken says recruiters from the Ivory Coast cross the border into the destitute country and lure children over with promises of money or even bicycles. Once they get there, he says, "they're forced to work, not paid, and not allowed to leave — the U.N. definition of slavery." When I read about his "act of protest" I instantly thought of that plastic train station in the photo above. I can't quite call it my own act of protest but it has now become my constant reminder of how I want to live my life and shape my choices. It reminds me of what I don't like about these types of toys - that they are designed to entertain. The toy requires very little imagination - everything is laid out in bright colors with the finest details and it even includes sounds and music. It's flimsy and you can tell that it was designed to head to the dumpster. But the worst part, for me, is that I bought it. And that is what is at the heart of this reminder. That one day, last year, I had an impulse to buy this. I saw it and thought, "Oh! Toy! Fun! Trains! Plastic! Colors!" and I bought it. All the pieces were there. It looked shiny and new but it was used! I just had a strong desire to buy it. As I walked away from the stand at the brocante, it hit me. I didn't want this thing. This is exactly the kind of thing I don't want to buy. I schemed for months trying to figure out how to get rid of it - I felt too guilty giving to friends or even re-selling it. So I shoved it in a box and pushed it into a corner so I could pretend that it didn't exist. And, now here it is again, brought back to life before my eyes, sitting there reminding me. I take some comfort in this though. We've made a lot of efforts in moving towards a more sustainable and creative lifestyle that involves very little consuming but we still have a ways to go. This little plastic toy is one of my partners in the fight against the shopping impulses that are still somewhere inside of me. Even though it was a gray day we decided to let Felix 'bike' to the market. It was fairly early for the real market crowd (although les marchands had been there quite a long time already) and this coupled with the weather, left the streets empty. Our little town blocks off most of the streets surrounding the market building on market days and it turned out to be a great place to bike. I've been wanting to write about my feelings after seeing Part 1 of Noam Chomsky's Manufacturing Consent*. (We still have to watch Part 2.) Right after watching it I felt gloomy, thinking about all those people out there who are unaware and disconnected with the forces at play around them. I thought about those people stuck contributing to the golden arrow, living a life completely oblivious to the impact they are having on the world. (And content either living in oblivion or finding ways to justify their apathy.) Granted, I can't completely blame them. The propaganda machine spends millions (probably billions) on figuring out how to get each and every one of us. Take greenwashing for example. But then I made myself a green smoothie** and started to think about the world as a glass half full. There are some amazing things happening out there. And I am talking about beyond buying organic products or using cloth diapers. People who are stopping and asking themselves, do I have to participate in this machine? Questioning their consumer habits, recuperating, reusing, free-cycling, and some even daring to stop shopping completely. I read blogs of families who are trying to help their children become divergent thinkers, to see the beauty in the everyday, outside instead of in front of a television or game console. Mothers who are creating art alongside their children. Friends who a year ago weren't even considering their impact on the world and who are now changing their lives little by little. I read blog posts about using local ingredients, wild herbs, and living a slow life. I'm proud because in amongst the consumer crap and hype there is a genuine movement and I realize that even when I feel overwhelmed by what feels like intertia (with myself and the world) that there is always a "Yes!" for every "no." You're responsible for the predictable consequences of your actions, you're not responsible for the predictable consequences of somebody else's actions. The most important thing, for me and for you, is to think about the consequences of your actions. What can you affect? "These are things to keep in mind. These are not just academic excercises. We're not analyzing the media on Mars or in the 18thcentury or something like that. We're dealing with real human beings who are suffering and dying and being tortured and starving because of policies that WE are involved. We, as citizens of democratic societies, are directly involved in and are responsible for -- and what the media are doing is ensuring that we do not act on our responsibilities. And that the interests of power are served, not the needs of the suffering people, and not even the needs of the American people who would be horrified if they realized the blood that's dripping from their hands because of the way they are allowing themselves to be deluded and manipulated by the system. *You can listen to the movie and read the script here. That's pretty cool. **I was inspired to make a green smoothie by Barbara at Sugar Magnolia. Check out these awesome felt slippers she made from a thrifted sweater! My first Day In the Life photo project. I added my comments about the experience in amongst the descriptions of the photos. My one regret is that I can't find a way to present it to you in a slideshow format that includes the commentary. Oh well...here is a link to the photo set on flickr or you can just proceed forward and read about a 'day' from our life below! Inspired by my virtual friends at (Mere) Mortal Mama and The Trivial Pursuit of Happiness, I decided to try a "Day In The Life" photo project. Doing this project didn't actually occur to me until I was in the process of chopping leeks last Wednesday morning. So I just went ahead and started right then. It was 8:30 am and we had already been up for at least an hour and a half. There was lots of train playing and struggles to get dressed but now a half hour before we head out the door, everything was tranquille. And why was it so tranquille? It is thanks to Dan Zanes (and everyone else in the band). It's so funny that this ended up as part of our 'day' today because we rarely watch dvds. We rarely watch anything but if we do it is usually something on YouTube. This was nice though - Felix loves listening really closely to music so he got absorbed and I was able to dance and sing along while I chopped away. Out the door (this is view to the left as you step out of our front door) and off to the halte garderie. For Tibo and I, our lives are far from regular. Our schedules change frequently but I think we've done a good job of finding a balance for our family. Felix lives on a pretty fixed routine but we have just enough flexibility to spice it up regularly. This particular week I am working more than usual but I still saved Wednesday morning for myself. I need my Wednesday morning to survive. And Felix gets to spend three hours playing in one of the coolest places I know. You see? He loves it there. Me too. I feel so good about leaving Felix in this environment. It is so lovingly and intelligently adapted to his age. There is a lot of free play and rarely does he come home with "cookie cutter" art. Instead we get lots of finger paintings and pages filled with brightly colored stickers. They sing songs. They read books. And there is a ball pool. A ball pool is always cool. When I got home I enjoyed the sunlight in my kitchen while I finished cleaning up from the morning's projects. Then I sat here and worked for the next two hours. In addition to preparing for the next six weeks of school, I also worked a bit on my classes online. I didn't get too distracted. Same street, different hour, and shot from the hip. This is just a little bit further down from our house. I'm on my way to pick up Felix. We saw these guys working on our way to the garderie this morning but we rarely take time to stop on the walk there. On the other hand, the walk home is always mellow and we stop a lot to explore and observe things. They were digging a huge hole in the road and Felix leaned against the fence, enjoying the show. This just might be my favorite shot from the whole day. Waiting for the RER C - our branch of the suburban train system. So one thing I failed at in my first DITL is meal times. We just did the whole prep-eat-clean-up thing and I completely forgot to pick up the camera. Today was a bit out of the ordinary because I was working in the afternoon in Paris. Normally on Wednesdays Felix goes down for a nap around now but today I had to work at 2:30 so we headed into Paris to meet Tibo, who was finishing his work at 1:00. And here 'we' are on the train. Hopped on the metro - line 14. And then we waited at a park for Tibo to arrive from wherever he was in the Paris region. Felix insisted that I go down the slide too and I was surprised at how fast it went! Papa! Felix sees Tibo coming from afar. From here, Tibo and Felix head back towards home. Felix loved every minute of this exchange because it involved trains, metros, parks, playing with both of us, then a bus, more trains, and home again. Whoosh. At work I completely forgot about taking pictures. I was in work mode. Making photo copies, teaching my lovely 13 year old boy (he was definitely one of my favorite students in a long time), and then packing everything up to head back home. I only taught an hour and half (one class) but technically we are on vacation. I only work at this particular place during the school vacations. I am their adolescent specialist - which basically means that I am willing to work with teenagers. Luckily, I really like it too. I teach individual intensive week sessions. I was hoping to pick up a bike for the short little downhill trip to the metro but alas, there were none. An hour ride home and then the vacation part of the day. The leek quiche is ready to go in the oven and that leaves us time to just play. Watercolors and trains. Good music. Maman and Papa. Yum. Yum. Yum. We loved them so much that I made a second batch two days later. They were shared with friends and that makes everything taste even better. My mom has done a great job finding used toys for us. She knows that we aren't big on the plastic crap and she also knows that we try to buy (if we must buy) as much as we can used. He loves this vintage well-loved bus and takes his passengers on adventures all over the place. Especially to school - I'll have to get a shot of that! Here are some more photos of the bus. Day 26: Wandering around Paris without a plan. We left the house and walked at Felix's pace - missing a bunch of trains - and eventually when we had 15 minutes to kill at the station, I persuaded him to take a photo booth shot with me. We had three chances and he was just weirded out by the whole thing, which is evident in both of our faces. I still love photo booths and I know that he'll get more and more comfortable. Now, we need to find one that lets us take more than 1 photo. Day 27: Still lots of school work but I am loving my classroom management class. It is based upon the ideas of the Responsive classroom and I already have a ton of new things to try with my students this year and next year.